It's finally October! I'm so excited. I have so many things going on this month that I have been itching to get started on the month. Now that it's finally here, I'm a little overwhelmed as I look at all that needs to be done. 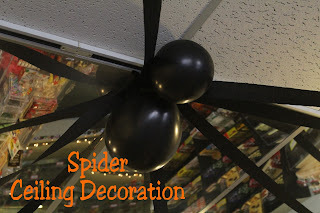 So I'm starting out with a super simple ceiling decoration that is quite the eye catcher! I started with a roll of crepe paper from Dollar Tree, a pack of black balloons from a local grocery store, and a bit of packing tape. I started in the center of the room and made 8 legs going out to the edge of the room. I didn't go all the way to the wall, but about a foot or two from it. There I taped the crepe paper and let another foot dangle down. Using two balloons, I made the spider's body. One balloon, I blew up as large as it would go for the spider's body. The second balloon I blew into a circle for the spider's head. Then I put a bunch of packing tape to the underside and positioned them in the center of the room on the meeting point of all the spiders legs. Now I have a huge but relatively friendly spider in the center of the room. I'm not sure you can tell from the pictures, but it's super cool and really is an eye catching piece! Kim that is so awesome!! I love it! What a stunner and for such a great price! Is it OK to pin it? ?